I whoop inwardly: YES! Finally! There is something about school that he likes! YAY!!!!!! Thank you Mr. B., energetic rapper, grandfather to another Aidan, and devoted teacher. With your sense of humor and enthusiasm, you sparked Aidan to have an interest in politics, the electoral process, and World War 2. It was the one subject this year that neither I nor my husband needed to coach. (I do the humanities, my husband does math and science. At least until we get so frustrated that we opt to switch places. My husband has assisted with writing some remarkable poems. And everything Aidan knows about linear equations, he learned from me.) Mr. B., you were organized and predictable, which helped him tremendously. You listened to Aidan and allowed him to play a prominent role in the classroom, inspiring him to be more confident. In short, you connected with him. For that, I am profoundly grateful. P.S. I heard your rap was awesome. When my son was about a year and a half, our babysitter’s husband fell ill and she couldn’t take care of Aidan. For this period, I brought him to back-up daycare at my office. The daycare center was well-run with good people, but it was not home and the good people were not “Grandma Phyllis.” Day 1, I followed instructions to minimize the separation torture – ie, quick hug and walk away. Off to work, I spent the day worrying. I did not visit him at lunchtime – I was assured a mid-day visit would make the separation worse. Day 2, he knew where we were going. This little 18 month old who was hardly speaking any words yet, sat next to me on the Manhattan-bound train and gave me the silent treatment: proud, stubborn, hurt. He looked out the window, refusing to make eye contact or snuggle with me in any way. Enraged at the person he loves most, he stared stiffly out the window. I took his hand and tried to explain. He said one word: “Home.” This from the boy who did not speak yet. My heart broke. My mother tells the same story about my first day at Nursery School. When she asked me how I liked it, I said: “Too shy.” Never an extrovert, I did grow to love school. Eager to please and competitive for the A’s, I thrived at school. I wanted my children to do so as well. Not just for the intellectual stimulation and social life – and social validation – but because I was busy busy busy with my career and couldn’t really deal with them not fitting into the realm of “normal” school life with its structure and schedule. I have fantasized about living a more adventurous life of travel and home-schooling them, but alas, I am very risk-averse and quite embedded in our suburban life. My children have had no choice but to plod off to school dutifully every morning and work on their homework diligently every evening. No breakdown in the routine allowed for working mothers, nor their children. So the years go by. After Grandma Phyllis, there is Pre-School, Kindergarten, Elementary School. We are in a “good” public school district with an array of teachers. Most of them are competent. Many of them are truly gifted and dedicated educators. My older daughter got the competitive-for-A’s gene and sailed right to the top of the class and has stayed there. Because she is a girl, who is smart, funny, and obedient, her teachers adore her and encourage her. My son is also smart, funny, and obedient, but he really has not liked school very much. He is not competitive for A’s. That is his sister’s territory. His motivation stems mainly from a desire to not disappoint us, not from a burning desire to learn. Because he is a boy, who is sensitive, distractable, and disorganized, most of his teachers have treated him like just another boy in the middle of the pack. He doesn’t get the encouragement that the top of the heap gets, nor the attention that the truly challenged genuinely require. There have been a few exceptions. Pre-School was nurturing and safe, a supportive entry point. First Grade teacher Mrs. G. whispered that he is a treasure. Fifth Grade teacher Mrs. B. tried a tough approach, recognizing that he was smart and demanding that he actually work. But mostly, Aidan has just wanted to come home. Homework was a chore that took him away from more comfortable at-home activities, like tending his garden, playing with his birds, or getting lost in the stories on tv. Every year, we are all relieved when Summer arrives and the school routine ends. No more checking the homework, coaching the hard subjects, organizing the backpack. No more nagging – “Did you remember: your library book, your lunch, your homework, your essay, your permission slip, your housekey, your instrument, your gym clothes.” Constant nagging. We try to encourage Aidan to read and write and practice math over the summer, but I really don’t have it in me to insist. September re-entry is rough. It’s a long uphill slog until December. He gets grounded January – April and then really catches some wind and sails through to June. Here we are at June. I am so proud and so relieved. Finals still to go and then graduation from Middle School. I remember Kindergarten orientation where I had to leave the room with a lump in my throat after the Principal said: “Don’t blink! 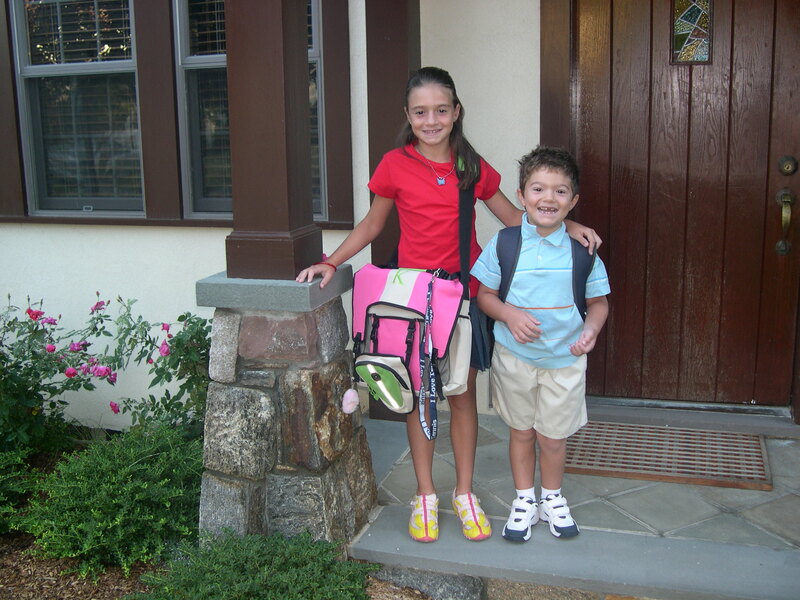 Before you know it they’ll be on their way to college!” Sure enough, I blinked, and my daughter is beginning the college admissions process and my son will soon be embarking on high school. And so, as I wonder how to help my son navigate the choppy waters of puberty and high school when all he really wants is to be home, I thank the teachers who muster their entire arsenal of professional and personal experience to connect with their students – recognizing and encouraging what is unique about each individual in the hope that they will shine forward and become a fully realized human being, even if they are not competitive for the A’s. A good teacher that connects is such a rare and special thing. Bless them! As for the “choppy waters of puberty and High School,” well, you will handle that like every other transition – one day at a time, following your excellent intuition to deal with each challenging moment as it arises. Love the post! Namaste . . .